One of the very first places my friend and roommates felt comfortable and frequented when we moved to Brooklyn was the Old Carriage Inn Lounge, which we lovingly called Sports Bar. Sadly they are closing after many decades in operation. It as great to learn the history of this business and building, which played such a big role in my personal history. I love a good list of pet friendly houseplants!! I can’t wait to visit this really quite fascinating town, Roosevelt, NJ. I was so happy to see Chagin Soap get a shout out on Tree Hugger! 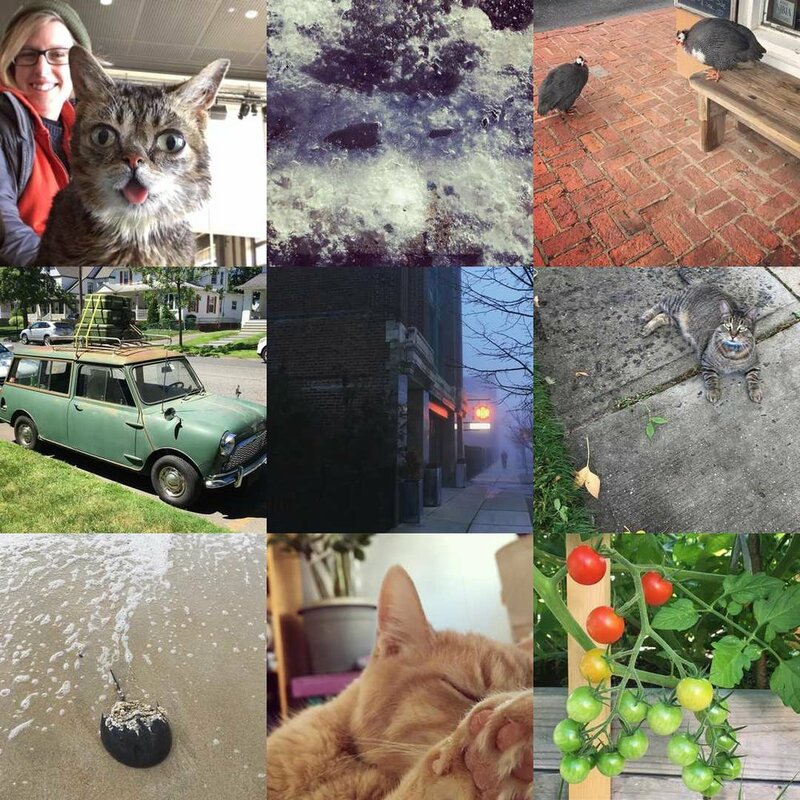 I love to look back and see what my Best Nine instagrams were according to likes. Lots of cats and other animals this year, no surprise there. And I’m glad our garden made it in! I struggled to find this website this year, I guess a few similar ones have popped up. The original Best Nine is my favorite. Have you tried it, yet? I also like to look back at my past years. I love to see how the color palate changes. Even though he hasn’t had had many pics, I also did one for @irving_barry. And here is my husbands, @anlight. I really liked that his was very thematic. The minute the weather changes to Winter cold, I worry that I’ll never go outside again. But we were able to get out and about a little in November. 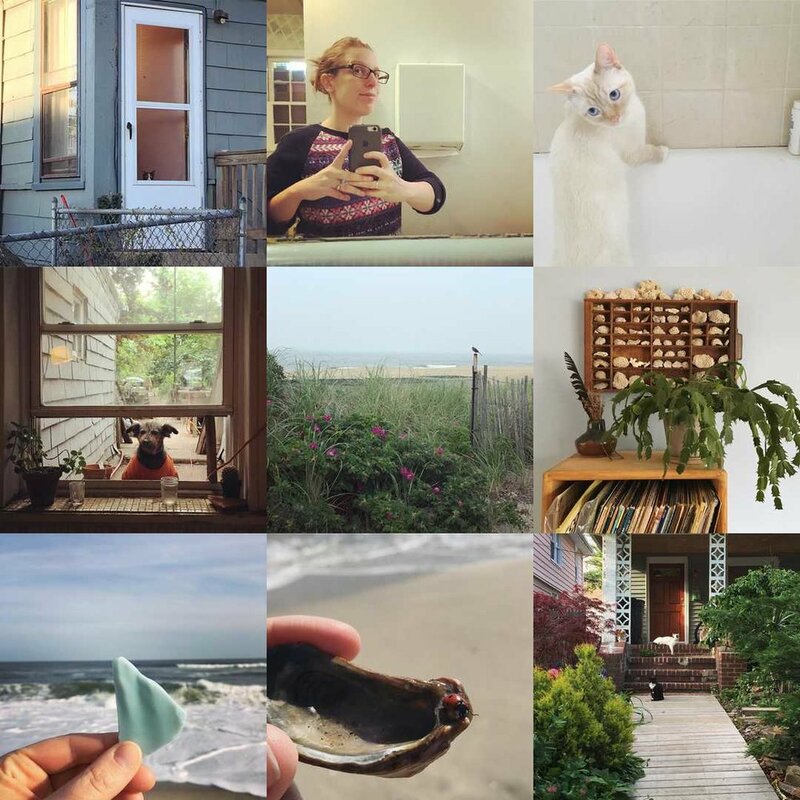 We went to one of our favorite beach-combing beaches, we went to one of our favorite breakfast spots and all their plants, we walked around our yard and neighborhood, and we watched our garden transition into Winter. The walk up to the beach. Look at all that goos stuff!! Some happy plants (some not so happy). I moved all the plants around this month. It makes some fun new corners around the house. Record collection is guarded well. Te garden is slowly being taken over by Winter. Is it Fall where you live? What are your plant observations for the month of November? November went by so fast, and the year is nearly over. The weather turned very cold, so bundling up was necessary. Despite that we were still able to see family and friends, enjoy the holidays, have some walks on the beach and get a lot of work done. 1) Flounder… 2) …flounder. 3) Porch #watchercat, 4) And another warm inside. #watchercats were out, finding sunny spots this month. We tried to save a flounder on the beach, and hung out with Flounder at home. 1) Morning light. 2) Afternoon light with a friend. 3) Morning essentials. 4) Giants in the sky. We traveled only a little this month, heading to Brooklyn a few times and visiting a few toy shows around NJ. Our holidays were very relaxed and we were super happy to see family and friends. 1) Recipe coming soon. 2) A little bit of zen. 3) Holidays collide. 4) Instant collection. Over all it was a really good month! We’ve started to reflect on the past year and look ahead to the new year. Here comes December! Starting in October, I planned on picking a theme for the each month to focus on in this blog for the rest of the year. My theme for October was all about me. I found that topic pretty hard to stick with! Talking about oneself can be hard! For November, I’ve picked a topic that should be overly easy for me to go on and on about: my house and home! Another reason to talk about our house in November is bc November 12th is the 3 year anniversary of living here! We bought our house in July 2015, but were still transitioning to living in a different state so didn’t fully move in until a few months later. For the most part, moving into and living in our own house is as fantastic as I imagined it would be. After 15 years of apartment living, being able to fix anything, or do anything we want to our own house is wonderful. One thing I wasn’t expecting was that the contents of our apartment, which was about 1/2 the size of our new home, completely filled the house, including the basement. When we moved we bought very little new items, but somehow we had furniture, clothes, books, and stuff to fill every nook and cranny. Slowly and surely we have been making our house our own, some of that involves learning what we want our house and lifestyle to be. Cleaning, decluttering, curating, and “upgrading” our house has been a wonderful and sometimes difficult experience but I wouldn’t want it any other way. This month, I plan to share more about our house, how we have and are making it our home; more about where we live and why we love it. Plant observations were many this month. We had a lot of opportunity to walk around town, be in our yard, and visit new places. We saw bees buzzing, squirrels scavenging, flowers blooming and dying off, creatures and plants working together and everything getting ready for Winter. On days that were clear the sky and trees were amazing. Hardest working bee in Asbury park. The basil bolted a long time ago, but we just let it go for the other plants and animals. Some of the flowers we planted are still blooming. The dunes looked majestic in October. We saw many mushrooms this moth but some of the best ones were shelf mushrooms. We visited Allentown NJ and saw these fellows enjoying the river and surrounding plants. Allentown also had a civil war reenactment. It was neat to see a world as it may have been. The rainy days made everything green and vibrant. The weather was mild and it was a lovely month. For November, we are planning on ways to keep our plants happy over the Winter. What were your plant observations in October? Since first moving to New Jersey and into our own house, we have wanted to start gardening. It took about 3 years, but this Summer was the first year we seriously started growing vegetables. We started small, but this was a great introduction to gardening at home! We started basically everything from plants, except our radishes which we started from seeds. For us, starting from plants was less intimidating and we thought we would have more success. We had lot of success with just about everything we planted. Our main bed, and the biggest producer, is in our front yard. My dream is to have more and more beds in our front yard since we don’t really utilize that space. We planted four or five different tomatoes, basil, orange thyme, and shishito peppers. We also planted items in pots that were scattered between front and back. In the back we already had blueberry bushes and we also put a raised bed with kale, hot peppers and radishes from seed. We plan to devote one whole side of the yard to our garden next year, have some space in the middle and eventually plant fruit trees on the opposite side. This summer was mild but we had lots of sun and lots of rain and the garden loved it! Our tomatoes exploded. We ate one of our favorite meals, tomatoes and mozz, all year and never bought any tomatoes from the store!! 4 small tomato varieties - these were bananas! Next year I hope we label/mark/ remember what we plant. That would have been nice this year. 1 large tomato variety - these got completely over shadowed, literally, by the small ones so they didn’t produce much. What we did have was delicious! We like the smalls better, but it seems worth it to have one large each year. Shishitos - this was my favorite thing we grew this year. I want to have like a million of these next year! Hot peppers - I’m not sure if we even ate any of these. Kale - Next year we have to get better about harvesting and eating our own kale! Radishes - Why did we even grow these? We tried pickling them but they turned out pretty bad. Next year, if we plant them, we will only do a few at a time. Basil and purple basil - what we planted in beds did really well, the ones in pots not so much. I hope to plant again next year but be better about picking and using what we grow. Orange thyme - probably my husbands favorite thing we grew, we will def be planting this again. Assorted herbs - some of these I’ve had for ears and they just keep coming back, some are new this year. I want to get better and maintaining and using herbs next year. Blueberries - our bluebs did really well this year. Over the winter we hope to protect them better bc they took quite a beating in heavy snows last year. Raspberries - we only got a few but they were good! We have them in pots, but perhaps we will transfer them to beds or the yard next year. Strawberries - we had more strabs than ever before but never got to eat them. We could never get to them before the critters. Looking at the list, it’s a lot longer than I thought it would be! I can’t wait to grow more next year and rely on store bought foods less! What did you grow this year and what are your plans for 2019?